The Government of Nepal commits to equitable access to voluntary Family Planning (FP) services based on informed choice for all individuals and couples, in particular the poor' vulnerable and marginalized groups. The main aim of the National Family Planning Program is to ensure that individuals and couples are able to fulfill their reproductive needs by using appropriate family planning methods based on informed choice. Family planning can reduce unmet need for contraceptives and unintended pregnancy which ultimately helps to improve maternal and child health, empowers women by allowing them to invest more in their children and earn wages outside the home. In addition, it also helps communities and country to boost economic growth by expanding healthy and skillful labor force and allowing them to invest more money in school, health care and infrastructure development. Overall, National Family Planning Program helps to improve the quality of life of people and develop a nation. 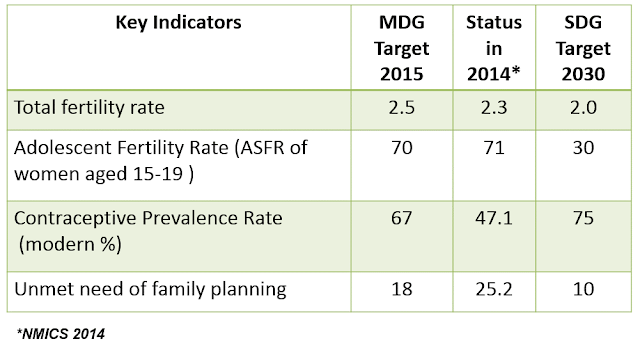 Family planning is one of the priority programs of Government of Nepal, Ministry of Health. 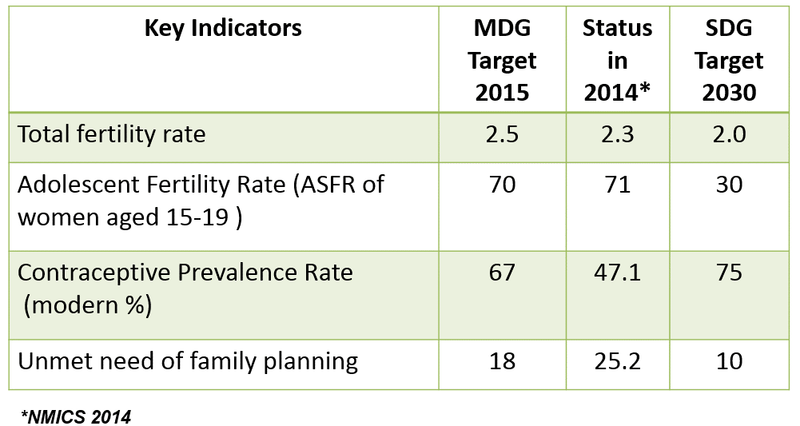 It is also considered as a component of reproductive health package and essential health care services of Nepal Health Sector Program II (2010‐2015), National Family Planning Costed Implementation Plan 2015‐ 2021, Nepal Health Sector Strategy 2015‐2020 (NHSS) and the Government of Nepal’s commitments to FP2020. 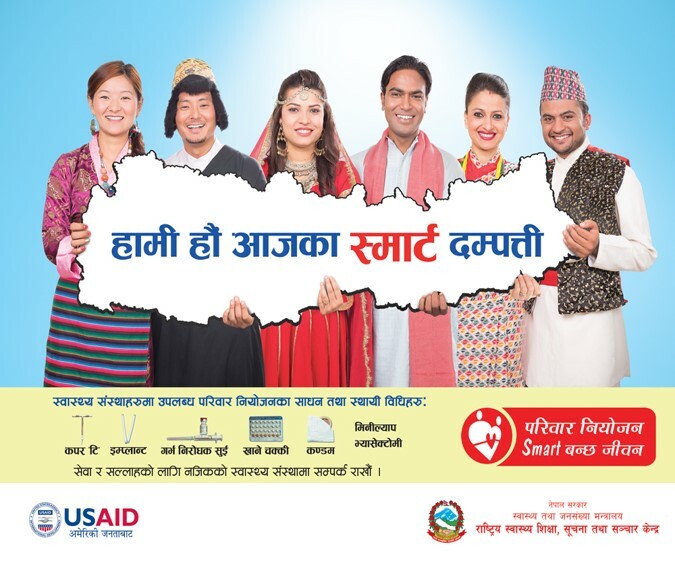 In Nepal, family planning information and services are being provided through government, social marketing, non‐governmental organizations and private sectors. In government health system, currently, temporary family planning methods (male condoms, oral pills and injectable) are provided on a regular basis through health posts, sub health posts, PHC Outreach clinics. Female Community Health Volunteers are providing information to community people, and distribute condom and resupply of pills. Long acting reversible contraceptive (LARC) services such as IUCD and Implants are available only at limited number of Primary Health Care Centers and health posts where trained health care providers are available. Sterilization services are provided at static sites or through scheduled “seasonal” or mobile outreach services. Almost all district FP MCH clinics are providing all types of temporary FP methods regularly. To increase access to and utilization of quality FP services which are safe, effective and acceptable to individuals and couples. Special focus is given to increasing access to services in places where the rural, poor, Dalit, other marginalized people and those with high unmet need live. To create an enabling environment for increasing access to quality family planning services to men and women. Enabling Environment: - Strengthen enabling environment for family planning - Establish family planning as reproductive rights of females and males. Demand Generation: Increase health care seeking behavior among population with high unmet need for modern contraception. Service Delivery: - Enhance FP service delivery including commodities to respond to the needs of marginalized, rural residents, migrants, adolescents and other special groups. - Increase availability of broader range of modern contraceptives and improved method mix. - Effective integration of family planning services with other health services. - Strengthen effective procurement and logistics management system to ensure regular availability of family planning commodities. - Promote family planning services delivery through government, private, non-­‐ governmental organization and social marketing approaches. Capacity Building: Strengthen capacity of service providers to expand FP service delivery network. Research and Innovation: Strengthen evidence base for effective programme implementation through research and innovations.